The bill was approved on Monday, January 14, 2019. On Monday, January 14, 2019, the House of Representatives approved House Bill (HB) 8794, criminalizing all forms of street harassment. 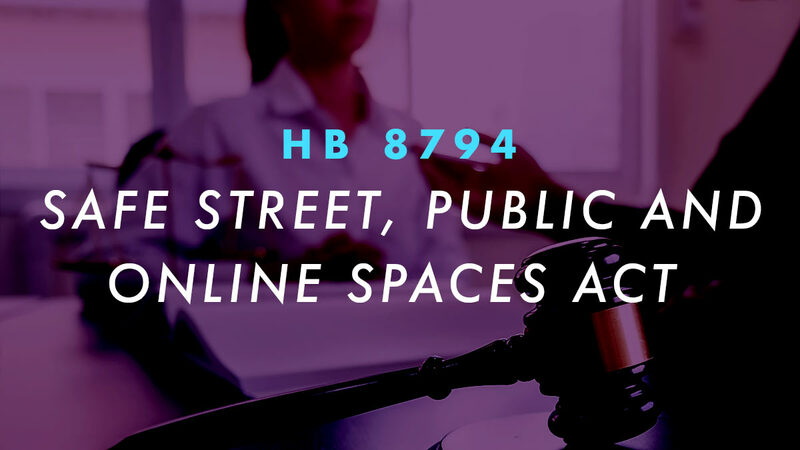 HB 8794 also known as the Safe Street, Public and Online Spaces Act encompasses "gender-based street, public spaces, and online" sexual harassment. The bill states that gender-based street and public spaces harassment include: "catcalling, wolf-whistling, unwanted invitations, misogynistic and sexist slurs, persistent uninvited comments or gestures on a person's appearance, relentless requests for personal details, statement of sexual comments and suggestions, public masturbation or flashing of private parts, groping or any advances, whether verbal or physical, that is unwanted and has threatened one's sense of personal space and physical safety, and committed in public areas such as alleys, roads, sidewalks, and parks." Online sexual harassment, on the other hand, covers: "acts that use information and communications technology in terrorizing and intimidating victims through physical, psychological, and emotional threats, unwanted sexual and sexist remarks and comments, online whether publicly or through direct and private messages, invasion of victim's privacy through cyber stalking and incessant messaging, uploading and sharing without the consent of the victim, any form of media that contains photos, voice, or videos or any information online, impersonating identities of victims online or posting lies about victims to harm their reputation, or filing false abuse reports to online platforms to silence victims." The punishment for violators ranges from a fine of P10,000 or 12 hours of community service "inclusive of attendance to a Gender Sensitivity Seminar" to a P500,000 fine or imprisonment.